The San Diego City Council on Monday voted down a proposal by Mayor Kevin Faulconer to regulate short-term rentals and passed a compromise measure championed by councilwomen Barbara Bry and Lorie Zapf. The new ordinance will limit short-term rentals by Airbnb, HomeAway and other services to an owner’s primary residence and one additional dwelling unit on the same parcel. The council also removed the exception for Mission Beach so the same rules apply across the city. The votes were 6-3 against the mayor’s proposal and 6-3 for Bry and Zapf’s compromise measure. 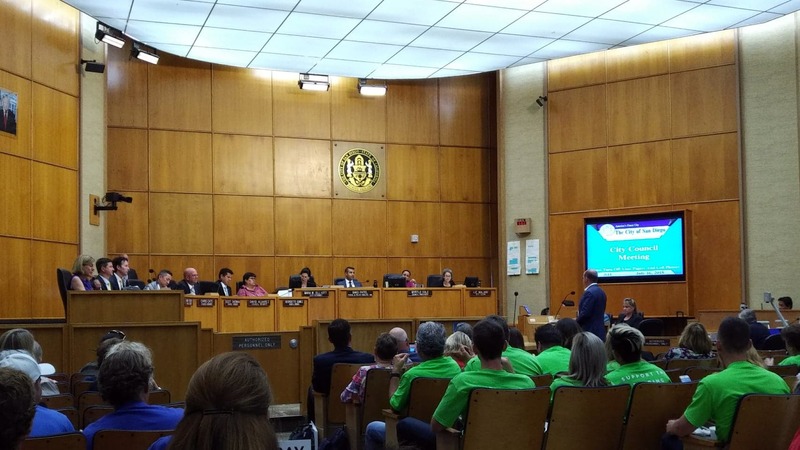 Councilmen Mark Kersey, Chris Cate and Scott Sherman voted in favor of the mayor’s proposal while councilmembers Georgette Gómez, David Alvarez, Myrtle Cole, Chris Ward, Bry and Zapf voted against. Cate, Sherman and Alvarez voted against the compromise. Short-term vacation rentals have vexed residents and city officials alike for several years. Until now, the City Council has been unable to pass a regulatory framework for home-sharing. Hundreds of residents, both for and against short-term rentals, packed the council chamber to voice their concerns. Some argued that they need the added money from short-term rentals to supplement their income. Others said valuable homes are being gobbled up by investors and pushing out families who would otherwise live there and contribute to the community. “Council’s decision today demonstrates a clear commitment to prioritizing the needs of our neighborhoods while maintaining opportunities for San Diegans to participate in — and benefit from — home-sharing and limited whole-home rentals,” said Councilman Chris Ward. But HomeAway quickly criticized the vote as a limitation of private property rights and promised to “evaluate next steps” in reaction. The City Council left rules proposed by Faulconer related to registration, good neighbor policy, enforcement and an affordable housing fee largely unchanged. The rules would be enforced by the city’s Code Enforcement Division, Treasurer’s Office, City Attorney and San Diego Police.